August 27, 2018 | Home / rAVe Pubs / House Of Worship / The Future of AV: Educate. Engage. Encourage. When does selling audiovisual technology shift away from the outdated features and benefits sales model and transform into something entirely different? Something so radically divergent that it actually makes sense to an AV industry in transition? 2018’s technology stack is here with the answer: when vendors leverage the social, marketing and sales technologies to go beyond personas to individual personal buyer profiles. It’s a combination of education, engagement and — here’s the key — encouragement during the buyer’s journey. There’s a catch: It requires the AV technology industry vendors to invest in non-AV technology to make it a reality. The future of AV: Educate. Engage. Encourage. And in that order. The shift away from the obsolete sales model of pushing AV technology features and benefits as a one-size-fits-most approach is possible because of another technology advancement and has three distinct elements: education, engagement and encouragement. The Digital Age has brought along the Personalization Age as technologies provide seemingly unlimited amounts of information about prospects and clients (if you have the technology in place). The result is an exponentially growing Internet of Things and networked technologies which can provide incredibly valuable insights during a buyer’s discovery journey. The education of prospects is not new, but the way consumers engage with educational content has changed dramatically shifted the power away from old-school vendors to those who build a community of promoters and sharers of information. Engaging with prospects has been refined considerably with the advent of content marketing. The buyer journey now has more nuanced points that rarely look linear in progression. And, finally, the revolutionary about-face of decision-making brought on by a vast sea of freely available information and insights means that deeply understands each user — not merely a marketing persona — and helps allay fears by encouraging them on their buying journey. New technology always brings about some level of adjustment. That’s tough because people are inherently resistant to change – even when there is a clear and obvious advantage. Our resistance is not about new AV technology in and of itself, but rather about changing the status quo of the way things work today. Educating the prospect has moved away from product information pages and downloadable spec sheets of generalized features and benefits. The new model of user education is now user-driven. Change is not only constant, it’s accelerating, and that makes buyers nervous, especially with retrofits or new systems in the house of worship market, where the technology cannot fail during weekend services. Content marketing is defined as a type of marketing that involves the creation and sharing of online material (such as videos, blogs and social media posts) that does not explicitly promote a brand but is intended to stimulate interest in its products or services. Read that sentence again and please catch the italicized (emphasis mine) truth. Education, therefore, is centered squarely around content marketing, which means all of your marketing and sales materials and content likely needs to be completely reworked and rewritten. Education is not what you want to tell them; it is the prospect discovering what they believe about your brand, products and services. Engagement used to mean responding to a user form or, more recently, replying to prospects on social media. In 2018, engagement is passively captured behind-the-scenes so that only prospects who fit highly specialized criteria are presented to Sales. Gone are the days of all prospects being treated as equal. Today, with the marketing and social media technology tools available, there are two aspects of identifying prospects: scoring and grading. Scoring is based on the activity of prospects across multiple mediums and platforms. For example, a prospect who follows a link to a specific landing page moves to specific portions of a page and comes back over time to educate themselves on your products and services will score points over time. Scoring captures the attention and engagement of a prospect so that their cumulative point value corresponds to their level of interest. Grading, however, weights their activities. As such, certain actions and activities have more value to you in identifying them on their buyer journey. Free downloads might have a lower grade point than attending a local tech showcase or a webinar your firm uses to engage prospects. When taken together, a prospect with a high score but a low-grade point should not be passed on to Sales but added to a new drip marketing campaign to try and increase the quality of their engagement. Conversely, a prospect with a relatively low score but high-grade point average may be further along on their buyer journey and primed to have a conversation with Sales. Engagement in the digital age has completely changed and it is up to vendors to appropriate and integrate the digital marketing tools to help engage prospects in AV buying cycles. When does selling AV go beyond educating prospects and engaging users? When the vendor truly understands what the prospect feels in the midst of a major change underscored by a big purchase decision. It is at this point — and only at this point — where the vendor can meaningfully encourage the buyer past the point of indecision. The customer buying journey includes education and engagement, as told above, but now with the advent of personalization tools and data points a vendor can accurately segment and target users on a case-by-case basis. While there’s still value in defining personas (especially for vertical market segments like house of worship, corporate, government, education, etc. ), there level of personalization with the right MarTech (marketing technology) tools allows vendors to reach the one prospect most likely to buy or walk away. Encouraging a prospect is not a push from behind approach nor is it dangling a carrot to reward the next step on the buyer’s journey, but is rather an honest and highly nuanced approach of timing the emails, chats, social media touchpoints, phone calls, and direct mail (yep, that can still work) to identify your understanding of their current place on the journey. It is empathetic, not manipulative, in nature. And it’s a long-tail approach with loyalty and repeat purchases on the other end of the journey. The antiquated AV sales approach of promoting products based on specs, features, and benefits of a product need be retired. It is not enough to tell every prospect the same narrative about the things your product does. Each vertical, each prospect, each application needs to know why your brand — and your products — are a great fit and a tremendous value. Like a phoenix rising from its own ashes, the AV industry needs a reinvention and rebirth which embraces the reality of non-linear buying journeys. A prospect doesn’t want to learn how your products work, they want to know how your products work uniquely for them. No feature or benefit valuable enough to stand alone across all vertical market subsets equally. The investment of the MarTech technology stack exists in platforms such as Pardot, Marketo, Infusionsoft, Hubspot, Hotjar, Wistia, WooCommerce, Intercom, UserZoom, SEM Rush, Connectio, Moz, Heap Analytics — the list just goes on and on with available tools. Below, I’ve included the annual visualization by my friend Scott Brinker, the leading authority on MarTech, which summarizes the stupefying number of software tools available to reach and understand individual prospects. This should give you pause, but it should also motivate each AV vendor to invest heavily in their own future. 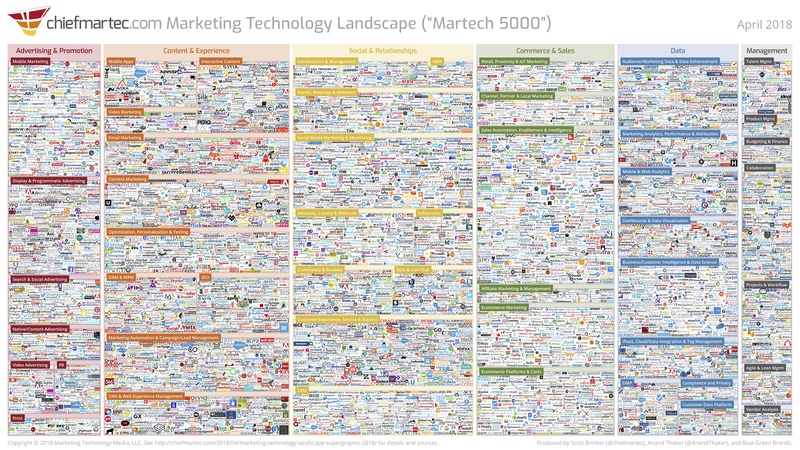 The 2018 MarTech Landscape of vendors, visualized. For perspective, this list has grown from around 150 vendors in 2011 to over 7,000 in 2018.